The HiP Awards are here again and the 2019 edition will start accepting nominations in March. The Interior Design’s HiP (Honoring Industry People and Innovative Products) at NeoCon Awards is a unique ceremony that recognizes commercial industry pioneers and achievement in product applications. One of the great things that came out of the 2018 HiP Awards is the River chair by Tonon Italia, which received an honoree HiP Award under the Hospitality Seating category. 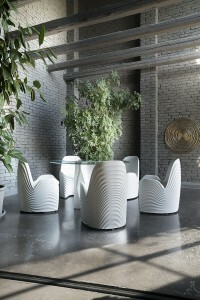 The River chair is called as such because of its wavy features. It is unique and comfortable. The product was launched at the salone del mobile 2018. As the name also suggests, the chair is inspired by nature. It has an organic design with 3D geometry. It is a great furniture for outdoor use as it could be amongst nature. It has a built-in water drainage system to combat the rainy season. This way, the chair will not be easily damaged. Made from molded polyurethane, the chair could easily withstand not just the rain but also the heat from the sun. It is also light, which makes it easier to move around. While ideal for outdoor use, it doesn’t mean that the River chair would look out-of-place indoors. On the contrary, the River chair looks just at home when it is inside domestic or commercial settings as when it is outside. It is truly versatile as in most of Tonon Italia’s designs. Founded in 1926 by Alberto Tonon, Tonon Italia was first based in northeastern Italy in the village of Manzano. Tonon Italia popularized the use of the technology of bent wood in 1929. By the 1930s, the brand had become known for furnishing luxury ships. Decades later, Tonon Italia has expanded the materials used in making furniture. The designs are also inspired by everything that one sees around like the paperclips, flowers and even crates. Innovations in design like this is very attractive to Interior Design, the American design publication behind HiP Awards. Tonon Italia is certainly making waves Stateside with the River chair, along with Tonon Italia’s hundreds of other designs. The HiP Awards is on its 6th year. The awarding will happen on June 9 at the Merchandise Mart in Chicago, Illinois.